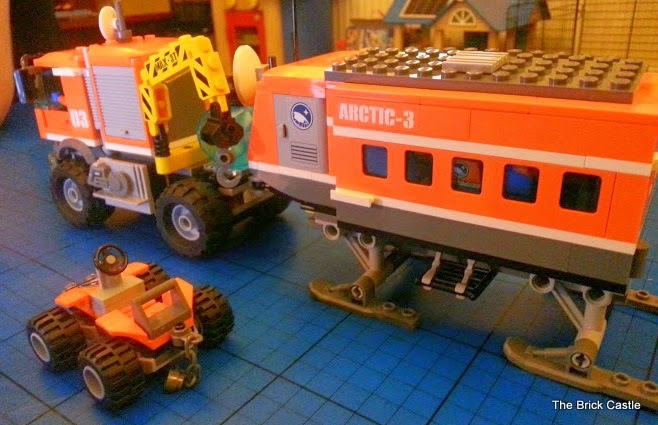 Yesterday's review from me was the LEGO City Arctic Outpost set 60035, which is a set designed for younger builders. It's a set that could easily be more detailed and complicated, but that would raise the difficulty level and lower the playability. The major change is the trailer. 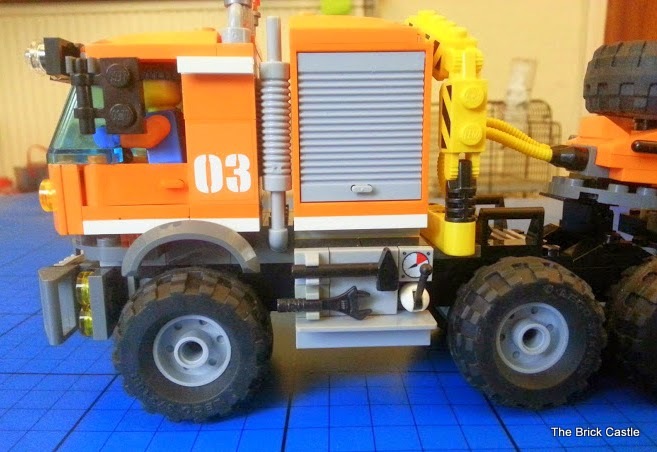 Able to carry the quad bike as well as the mobile laboratory, and with all the necessary chains and spare wheels, plus the large swan neck and 5th wheel behind the cab, it's fully able to turn and corner, and the ramps do actually lower to allow the cargo on the back. 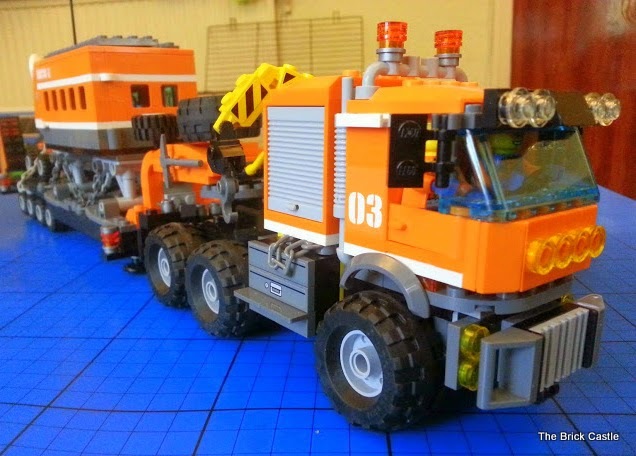 The truck has a control panel for the crane, an additional lighting rig and extra storage drawers. 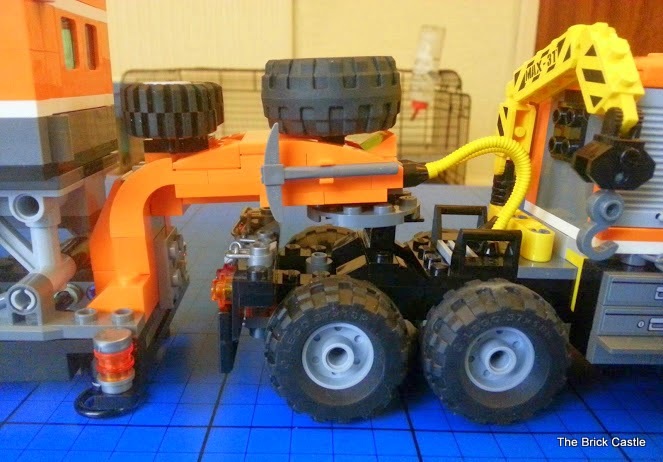 It's lengthened at the back to hold the fifth wheel attachment for the trailer and an extra axle and pair of wheels. 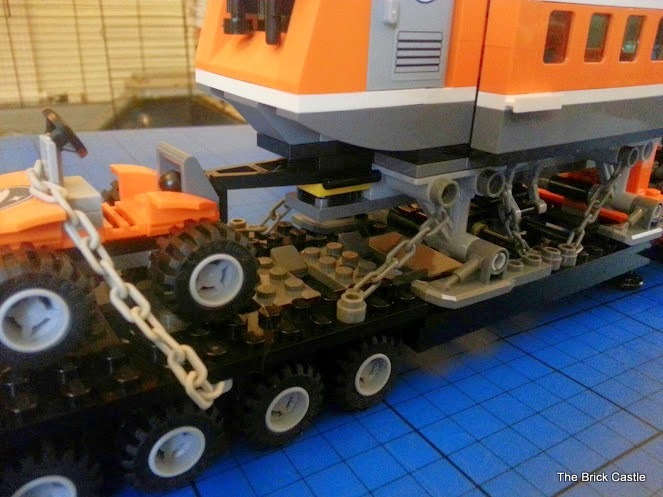 The trailer is made using mainly Technic LEGO and smaller wheels with mud and snow tyres. 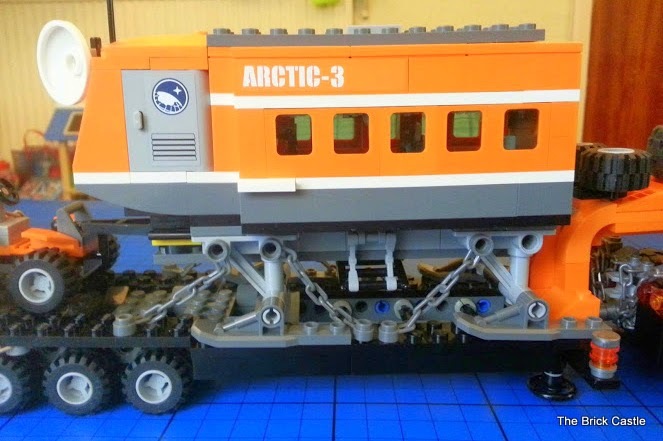 For imagination and play value this means the Arctic Outpost could start it's journey anywhere and dump the large trailer once the conditions become impassable. As the mobile laboratory is no longer the trailer itself, more of a passenger, it's chained to the flatbed, as is the quad bike. 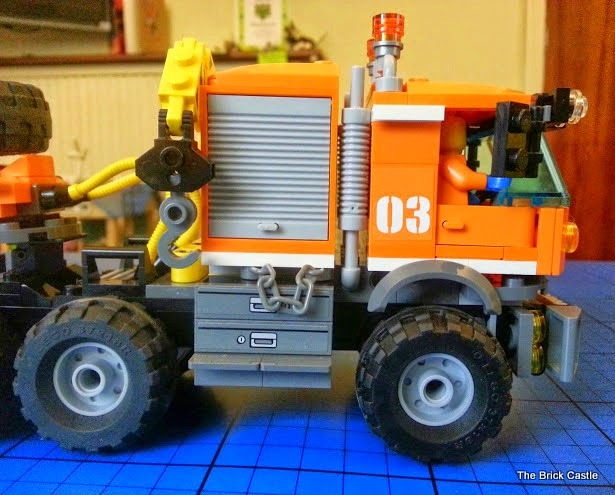 I'm impressed, I think it looks great and it's really opened our younger children's eyes as to what you can do given an already interesting LEGO set and a box of bits. 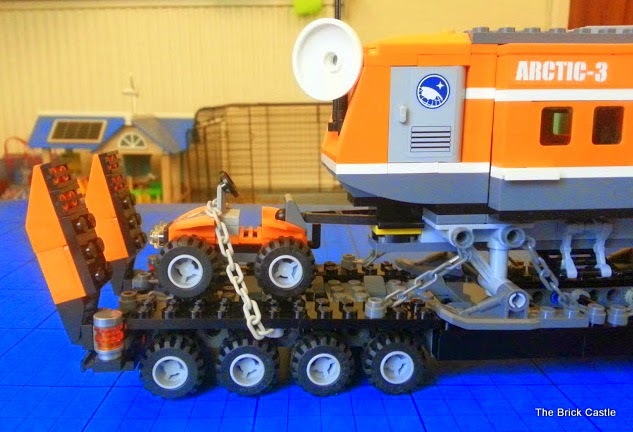 Based on the LEGO City Arctic Outpost set 60035, some extra chains and large wheels, the LEGO Cars And More Loose Bricks Box set 4635, and Monster Truck Racing Truck Transporter set 60027 for the main part of the chassis. They look very awesome! I love them! Very inventive! Men never grow out of LEGO do they?! That's fab! We love Lego in our house. 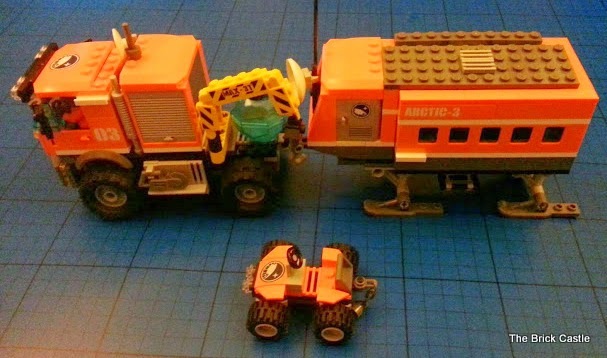 Wie kommt man zu diesem auf gemotzten arktick truk aus welchen Teilen lässt er sich bauen? Ich habe die Details am Ende des Artikels hinzugefügt. Ich hoffe, das ist hilfreich. Genießen! Thank you! It wasn't all done in one sitting, he thought about it a lot and fiddled with it over a couple of days, so it's really impossible to say exactly how long.